As the weather gets colder I always start dreaming of warmer climates, tropical fruit, stunning beaches, humidity and cool water. So it’s no wonder that Bali springs to mind! And what should pop into my inbox this morning but a lovely blog post by our guest blogger Kelly, based around her foodie experiences in Bali!!! 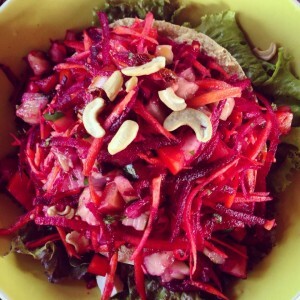 Kelly is an awesome raw foodie who lives and works in Byron Bay, NSW. We have had the pleasure of her assistance at 3 of our retreats now and we know how much she loves her raw food! Many people don’t realise that Bali offers up a lot more than just coconuts and cocktails, the raw food scene is huge in Ubud, where we hold our Embracing Health Detox Retreats. Many people decide to stick around Ubud for a few days after one of our detoxes just to sample all the amazing food on offer. Ok, the staff do it as well! 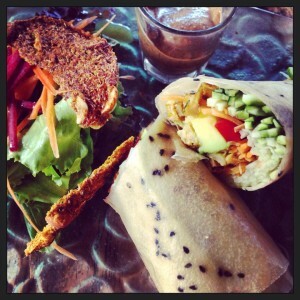 There is always something new to try, and I can tell you, the food just keeps getting better and better! Check out the cafe’s and restaurant’s Kelly has visited and read her reviews so you can plan your after-retreat-activities! We have our next 9-night Bali Detox starting on July 31st. See you there! Bali. The name alone carries you away to distant places- narrow curving roads that sweep through endless rice fields, an infinite ocean glistening below dramatic cliff drops, the smiles of the local Balinese as they move about their day and the floating tendrils of smoke that dance from the incense that sits in the center of the morning spirit offerings. In recent years, Bali has also become synonymous with a better way of living, encouraging people to take time out of their hectic schedules and relax with yoga, healthy vegetarian food, dance, meditation, massage and ceremony. 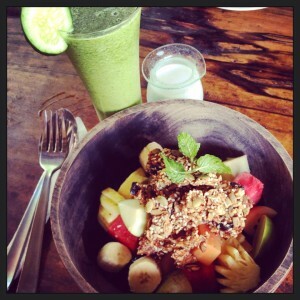 With more and more people coming to Bali with this aim to nurture their mind, body and spirit, places such as Ubud have become a mecca for yoga studios, health food shops, stores selling everything from mala beads to eco yoga mats, and last but not least, an influx of raw vegan food and eateries. My first trip to Bali was ten years ago. I was traveling solo on my first adventure outside of Australia. I had a one-way ticket that began in Bali and then onwards to Thailand and India. I remember wandering the streets and discovering two places that became my second home for the duration of my stay- they were the infamous Bali Buda, and the equally well-known Kafe. Ten years on, both Bali Buda and Kafe are going strong, both have expanded their original store and also branched out to new stores and cafes around the county. Alongside these two favorite, they have been joined by a host of vegetarian, vegan and raw cafes, all of which offer extensive menus that include superfood smoothies, slow pressed juices, gourmet raw entrees and decadent raw desserts. With only a week in Ubud this time around, and coupling that with the fact that most of that week was being spent on site at the Bali Spirit Festival, my mission was to visit as many of these raw establishments as possible to get a good idea of what Bali offered a raw vegan traveler. My experiences were, in all honesty, both hit and miss. There were some spectacular dishes and creative concepts that bought a smile to my face and sent my taste buds dancing. Yet there were also moments of disappointment, lots of repetition and what I encountered the most- lots of great raw food but made with little love or enthusiasm, which made the food and overall experience, rather disheartening. For me, enjoying a meal has so much to do with whether the person who made that meal enjoyed doing so. I love feeling that passion, that excitement, that genuine interest in serving and nourishing people. I felt that this was lacking at many of the raw establishments in Bali. My only guess is that westerners have arrived with the concept of developing a raw establishment and staffed local Balinese people, but in the translation and teaching, the passion, the intention, the whole concept of serving people life-giving food, has been lost. Forgive my skepticism though for now and allow me to move on to the highlights! I have to begin with Clear, purely because their food was possibly the best raw vegan food I have tried anywhere (and that is a world wide statement!) Their menu was extensive and creative, their presentation was divine, and their combination of flavours left me gobsmacked and thrilled, unable to put my finger on the precise ingredients and method of creation! The food I tried there was quite simple as I am not a huge fan of complicated, heavy, raw food that aims to mimic the standard western diet. At Clear I enjoyed their Clear Kale Salad which was an artful mix of turmeric, ginger, jicama, thai cashews, spiced pumpkin seeds and spirulina atop fresh kale with a cashew lemon dill or miso-orange dressing. Every mouthful was unbelievable. Amazing. So amazing, I ordered another to take away for dinner that night to enjoy in my guesthouse! Along with their signature salad, I tried their Bamboo Rolls which were coconut wraps filled with coconut jerky, green papaya, julienned red peppers, avocado & zucchini served with almond dipping sauce. Again, exquisite, every bite was amazing from the texture of the wraps to the perfection of the dipping sauce. Speaking of down to earth vibes, Down to Earth café was indeed that, a lovely, laid back, sweet and homely café above a great little health food store off one of the busy main streets in town. Their menu covers vegetarian, vegan and raw, and again, their food was lovely. I was disappointed however in their live food platter, a plate that was primarily not much more than sprouts and greens with little flavour or imagination. 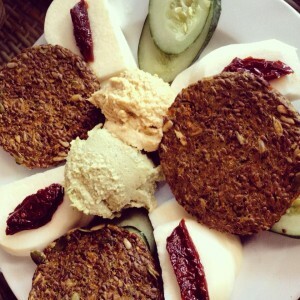 Their nori rolls were fabulous, so too was their Mediterranean plate and again, their macrobiotic plate. Yet the highlight of Down To Earth was their drink menu- their raw chai smoothie was amazingly divine, their kombucha was a real treat and their green smoothies were fresh and full of flavour. Their raw treats were quite standard, offering a wide selection of bliss balls and chocolates, and while nice, very plain and traditional! There were a couple of other places that are certainly worth mentioning. Every morning in Ubud I enjoyed breakfast at the same place- Little K. Little K is an offshoot of Kafe, and while Kafe is bustling and busy from dawn until midnight, Little K is off the beaten track and tucked away, a little oasis in the middle of the rambling jungle of Ubud! Their breakfast menu was lovely and I thoroughly enjoyed their big fruit bowls, their raw muesli, their homemade cashew milk, their raw porridge and many of their beautiful fresh smoothies, juices, coconuts, wheatgrass shots and jamu! Little K was a real godsend each morning, a tranquil space (with wifi which helped me work and holiday simultaneously!) where the staff were friendly and the food nourishing, simple and delicious. The guests next door to where I was staying in Ubud were performers that had come for the Sprit Festival and were also vegan. They swore by Café Soma where they ate pretty much every one of their meals for the whole week! I ventured there on my final night and found a tiny, stuffy, yet animated café down near the soccer field that was overflowing with smiling relaxed people. Their ginger kombucha was delicious and their homemade cashew ice-cream was a rich tasty treat indeed! However the meal I had which was cabbage rolls (appearing steamed not raw as I thought they would be!) lacked flavour and love. They were poorly presented, thrown together and had no ingenuity or integrity to them. So again, hit or miss! The owner who sat out the front seemed lovely and very friendly, and I like to think that perhaps the rest of the menu options are more rewarding! 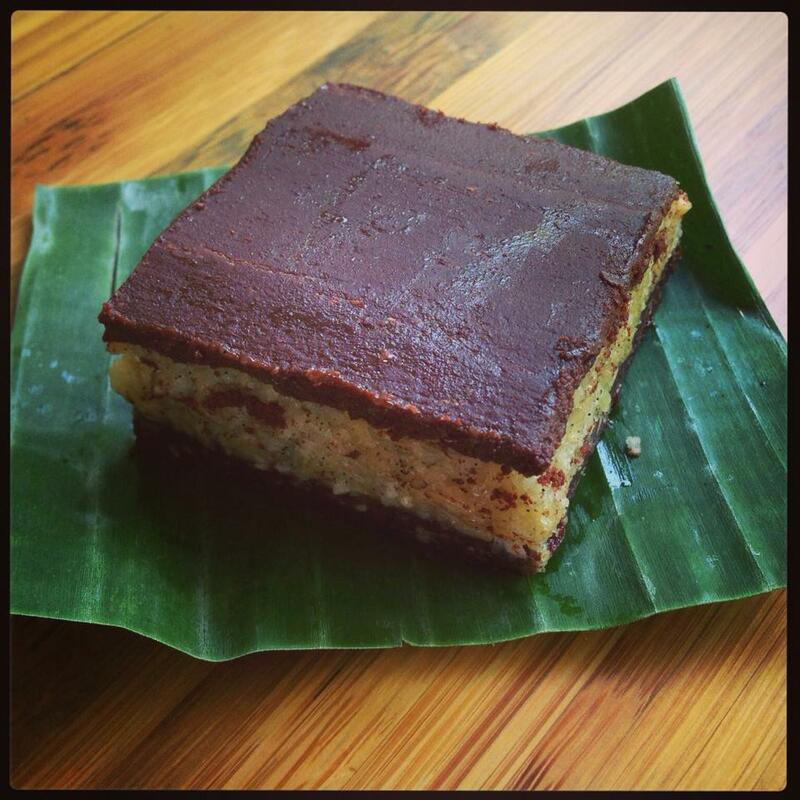 Last but not least was Bali Buda, one of the longest standing and first vegetarian cafés to receive popularity in Bali. The café was busy all day and night, but the service was quick and generally friendly. Their live food platter is simple but delicious, consisting of two raw dips, raw pizza crackers, raw vegetables and sun dried tomatoes. It was very flavoursome (a little garlicky!) but healthy and fresh. Their smoothies and juices read very well on the menu but unfortunately every one I tried was served above room temperature and lacked any flavour. One sip and I was done, and I tired at least half a dozen! Their bliss balls on the other hand were delicious, I fell in love with their spirulina and mint ball and their cashew cardamom ball! There were a few other places that I missed visiting and will have to save for next time! Seeds of Light only just opened when I arrived and I was saddened to miss this one as I have heard wonderful things about it, as well as the passionate and enthusiastic couple that have made this dream into a reality. All in all, it is very easy to eat healthy in Ubud, the choices for vegetarians and vegans are immense and there is plenty of raw food options if you take time to seek them out. I enjoyed the opportunity to see what was available and what was new in the world of raw food- I was pleased on occasions and disappointed on others. I simply feel that raw living food needs to be made and served with love, care, passion and understanding, and this is what I felt was missing in several of the places I visited. Finally, to finish on a good note, I will share my favourite tucked-away treasure! Sari Organics is a bit of a hike to reach, located a few kilometres out of town in the centre of the rice fields. Yet, the walk is well worth it. The café is not entirely raw or vegan, yet it is all 100% organic and almost everything comes from their onsite farm and land. The salads are huge and tasty, their drinks are refreshing and inventive. The love for what they are sharing is felt in every bite. Not to mention, you really feel as though you are in Bali here! You are surrounded by rice fields in every direction! The essence of what Ubud once was like is felt here, whereas it is hard (if not impossible!) to appreciate anywhere else in town. I think Sari Organics summed up my overall impression of the raw food scene in Bali- you need to create and share from the heart. I felt many of the places mentioned are seeking the client (in designer yoga clothing with their iphone, mac air, motorbike and mala beads) and forgetting why they are sharing or what they are sharing in the first place. So, my advice?! Take time to find the simple sweetness in Bali, it is in the quiet, the unseen, the delicate nature of things, where perfection really exists. 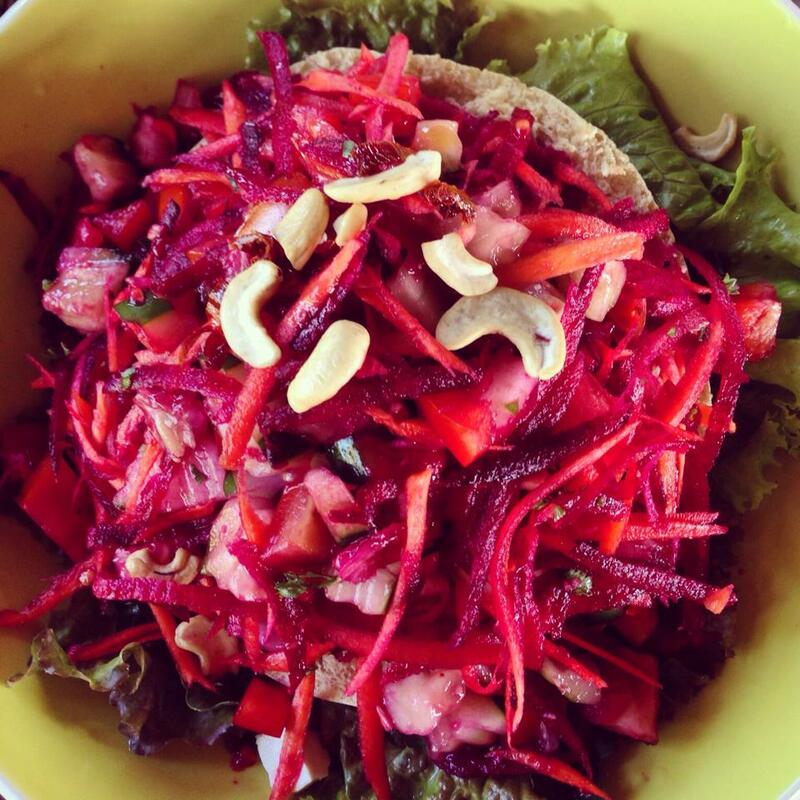 If you want to come and sample some of Bali’s raw cuisine our next 10-day raw, vegan detox retreat starts on the 31st of July in beautiful Ubud. Why not detox you mind body and spirit, then stay a few days extra to sample some of Kelly’s delicious finds? Previous post: Thinking About Saliva Testing? Next post: What’s In Your Non-Dairy Milk?